June 12 , by Mardi Robyn. Jennifer Young from “Endlessly Inspired” shares with us this fabulous tutorial she says, “is a super quick, inexpensive and easy way to make beautiful fabric-wrapped bracelets!” What a great idea! I have fabric I would like to use and try my hand at this tutorial! 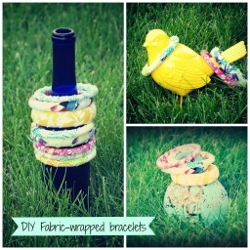 Learn how these DIY Fabric-Wrapped Bracelets were made and be inspired to make your own.